I can't believe its almost been a week since I last posted. I was just so proud that I'd managed to post regularly over the past couple of months, then the last few weeks took me completely by surprise. So many things came up all of a sudden, I barely had time to cook up our daily meals for us. I did make a few treats that I can't wait to share with you. I'm hoping things will be a bit more back-to-normal now. I have my fingers crossed. If you're wondering what I was so busy doing, don't fret, I will let you on to it really soon. I'd made this ice cream a couple of weeks ago. After the success I had with the Mango Ice Cream, I decided I was definitely going to try out a few more options. 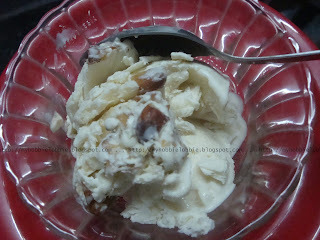 I had this sudden craving for a roasted almond ice cream. It was all I could think about for a few days. I had a scoop @ 'Natural's' when we'd gone for a movie and just needed to have some again. After scouting the web for a while, I came across a version of this ice cream to be made in an ice cream maker, that could be easily adapted to make a No Churn version. The best part is that this recipe uses no sugar. You heard me alright, not a grain of sugar. Honey is the only sweetener used. What I realized is that this ice cream tastes best after it has spent a few days in the freezer. The flavors mellow and blend well and the roasted almonds add a lovely flavor and crunch to it. I hope you try this out sometime. Spread the almonds on a baking tray and set it on the top rack of the over and grill till they've browned. Let them cool, then chop them roughly. Whisk the cream and the honey till it has thickened a little. Add the chopped roasted almonds and stir it in. Pour into a freezer container and freeze for a few hours or till set. The original recipe calls for it to be beaten every 45 minutes or so about 3-4 times. I did it just once and the consistency was nice and creamy. I'm sure it would've been fine even if I hadn't done this, since there was nothing with a high liquid content added to the cream. Thanks Suzy, you bet-its a fantastic collection! Thanks Ambreen, its really simple, you should try it! Very simple and easy to prepare honey with roasted almonds. Thanks Deepa, its not only simple but really tasty too! Oh Trisha.. so tempting.. would love to have that bowl..
Jabeen's Corner is hosting an event with a surprise giveaway.. Do send your entries.. Thanks Mehjabeen!!! I'll be sure to stop by!